You’ll find yourself in the chamber of secrets where your aim is to find the basilisk fang. Be careful, try not fall in the green acidic water and make your to the right of the screen. Shoot the large pink dome to reveal a Hermione bag spot. Use the bag spot by switching your character to Hermione and press the A button to activate the bag spot. Using the directional key pad rotate around the directional button to find a pile of gold Lego bricks. Use the ‘Windardium Leviosa (WL)’ spell on the bricks to create a transportation ring, stand in the centre of the ring and press and hold the A button to use the ring. Use the ‘WL’ spell on the snake heads to the right and left of the platform to expose the fangs. Head through the archway in the middle of the platform and press the A button to pull the lever and head back through the transportation ring. (Elder Wand Red Brick) – Jump over the newly positioned stepping stone platforms to the right and use the ‘Lumos’ spell on the devils snare from the second platform. Then use the ‘Reducto’ spell on the gate and jump through the gap. Switch your character to Ron and press the A button to use the parseltongue cabinet; this will produce a pile of Lego bricks and the Elder Wand Red Brick. Head back across the stepping-stones to central walkway and use the ‘WL’ spell on the pile of bricks to make a bridge. (Wizards Hat) – Before heading over the bridge pick up a pair of Spectraspecs from the Quibbler dispenser and then make your way over the bridge. To the left of bridge end you’ll see a bunch of semi-transparent bricks, slowly edge towards them and you’ll begin to see them properly and will be able to use the ‘Reducto’ spell on them. Jump on the first of the stepping stone platforms and use the ‘Reducto’ spell on the crate situated on the second platform to earn yourself a Wizards Hat. Use the ‘WL’ spell on the snake head to the left of the platform to reveal the fangs and then head to the lever and press the A button to reveal the next set of stepping stone platforms. Make your way back to the central walkway. (Fenrir Greyback Character) – (Free Play Mode) Switch to a ‘Strength’ character and press and hold the A button in front of the lever with an orange handle to reveal a pile of Lego bricks. Use the ‘WL’ spell on the bricks to build a bell and shoot the bell. A bat holding a character token will appear, just shoot the bat to gain the Fenrir Greyback Character token. Switch your character to Hermione and use the ‘Pet’ ability on the pet dig spot by pressing and holding the Y button to reveal a Hermione bag spot. Switch back to Hermione from the pet and press the A button to use the bag spot as described above to find a paint brush. Use the ‘WL’ spell on the paint brush to paint the rest of the Weasley walkway. Make your way over the stepping stone platforms to the ‘Weasley Walkway’. Use the ‘WL’ spell on the snake heads to the left and right of the platform to reveal the snakes fangs. (Bill Weasley Character Token) – Use the ‘Reducto’ spell on the gate to the right of the Weasley walkway and then use the ‘Reducto’ spell on the crate behind the ‘Weasley Wizard Wheeze Box (WWWB)’ to gain the Bill Weasley character token. Use the ‘WL’ spell on the ‘WWWB’ to move it into position and switch your character to Ron. Press the A button to open the ‘WWWB’ and retrieve a pair of Weasley sucker pad shoes and make your way up and across the Weasley walkway. (Wizards Hat Part 1) – At the end of the walkway drop down onto the platform below and use the ‘WL’ spell on the snake head to right of the platform to reveal a box on the central platform. (see Part 2 for how to retrieve the wizards hat. Then use the ‘Deluminator’ spell pressing the A button to gain the light from the lamp and place the light in the lamp above the door way; this will drop down a large black rock. Use the ‘WL’ spell on the rock to place it on the pressure pad to the right of the platform. Now stand on the pressure pad to the left of the platform to raise the gate. Stand on the third pressure pad which is situated through the gate to raise the final stepping stone platform. Press the A button to use the parseltongue cabinet to release a couple of Lego pieces. (Wizards Hat Part 2) – Make your way back to the start of the area where the crate appeared from below the platform, use the ‘Reducto’ spell on the crate to gain a Wizards Hat. Head to the far right and use the ‘WL’ spell on the pieces to create a drill. Then use the ‘WL’ spell on the drill to break up the large rock. (Lucius Malfoy Character) – (Free Play Mode) Switch to a ‘Dark Magic’ character and use ‘Dark Magic’ on the red and black bricks to reveal the Lucius Malfoy Character token. Head to the far right of the area where you’ll see a skeleton basilisk head, use the ‘WL’ spell on the head to open the mouth and then use the ‘WL’ spell on the tooth. Stand on the blue platform and press the A button to continue to the Room of Requirement. (Vincent Crabbe Character) – (Free Play Mode) Make your way to the right of the area and you’ll see a character token behind a red and black cage. Switch to a ‘Dark Magic’ character and use ‘Dark Magic’ to gain the Vincent Crabbe Character token. Continue to the right and you’ll come across a fiery snake, use the ‘Aguamenti’ spell on the water canister before the snake and then use the ‘WL’ spell on the water bolder to move the snake. Use the ‘Aguamenti’ spell on the flames and jump over the gap. Make your way around to the next gap and use the ‘Reducto’ spell on the light fitting. Use the ‘WL’ spell on the pieces left behind to create a bridge and make your way over it. Use the ‘Aguamenti’ spell on the flames to extinguish them and continue across to the left. Use the ‘Reducto’ spell on the cabinet unit to reveal a couple of Lego pieces and use the ‘WL’ spell to make a Herminoe bag spot. Switch your character to Herminoe and use the bag spot by pressing the A button to find a pile of Lego bricks. Then use the ‘WL’ spell on the pieces to build a ladder and climb up it. (Wizards Hat) – (Free Play Mode) Switch your character to a character with the ‘Key’ ability (e.g. Bogrod) and use the ‘Key’ ability to gain a Wizards Hat. Use the ‘Aguamenti’ spell on the flames across the gap (these are difficult to see from the other side of the gap) and jump over the gap. Shoot the bookcase and continue along to the right. Use the ‘Reducto’ spell on the pad lock and then use the ‘Diffindo’ spell on the red wall to produce a pile of red Lego bricks. Use the ‘WL’ spell on the bricks to make a fan, jump on the fan to get up onto the platform above and the snake will break up the wardrobe. Use the ‘WL’ spell on the pieces left from the wardrobe and use the ‘Aguamenti’ spell on the water cannon to make it spray the snake. Head to the left of the platform and the snake will break up the box, use the ‘WL’ spell on the water cannon left from the box and use the ‘Aguamenti’ spell to spray and defeat the snake. You will now find yourself in a fiery room with many platforms and your aim is to rescue Malfoy. Use the ‘WL’ spell on the ladder to bridge the gap and use the ‘WL’ on the table to create a weight on the ladder. Run across the ladder to make your way over the next platform, you will need to hold the left directional button to make the character get onto the platform. Shoot the crates on the platform to reveal some Lego pieces and use the ‘WL’ spell on the pieces to gain a broomstick platform. At the top of the platform shoot any remaining crates and use the ‘WL’ spell on the Lego pieces to create a water cannon. Then use the ‘Arguamenti’ spell on the water cannon to put out the fire on the next platform. Jump on the broomstick but pressing the A button and fly across to the platform with a cabinet on it, the broomstick will settle on the broomstick platform. (Draco Malfoy Character) – (Free Play Mode) Switch to a ‘Strength’ character (e.g. Hagrid) and press and hold the A button to open the wardrobe and gain a key. Use the key in the chest to the right to gain the Draco Malfoy Character token. Jump back on the broomstick and fly across to the platform to the left of the fiery platform with Malfoy on it and settle the broomstick down on the broomstick platform. (Wizards Hat) – (Free Play Mode) Switch your character Luna Lovegood and use the ‘Spectraspecs’ ability to reveal a box to the left of the broomstick platform. Shoot the box to gain a Wizards Hat. Head up to the parseltongue cabinet and switch your character to Harry Potter, then press the A button to use the cabinet to gain a key. Use the key on the chest to the right by pressing and holding the A button to reveal some Lego pieces. Use the ‘WL’ spell on the Lego pieces to create a water cannon and then use the ‘Arguamenti’ spell on the water cannon to put out the fire and free Malfoy. *May not be found in this level. 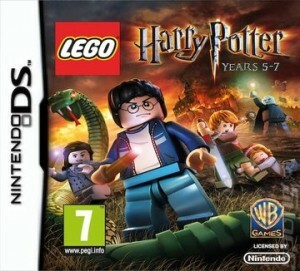 This entry was posted in DS and 3DS, Games, Lego Harry Potter Years 5-7 on April 28, 2012 by Tasha.